It was recently announced that Neil Blomkamp, the filmmaker behind the acclaimed District 9, the underwhelming Elysium and now Chappie, was going to be at the helm for a fifth movie in the Alien franchise. Most film fans were excited at the prospect of there being a new adventure with Ellen Ripley against the Xenomorphs, especially given the rumours of its following on directly from James Cameron’s Aliens (before Alien 3 and Alien: Resurrection buggered it up royal) – moreso, however, that Blomkamp was going to be the man to do it. Chappie, however, doesn’t encourage much anticipation if it’s anything to go by. 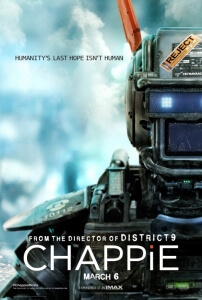 What is essentially a reworking of the Pinocchio story with elements of Short Circuit, WALL-E and Robocop thrown in for good measure, Chappie heavily promotes criminal activity in the suburbs of Johannesburg, South Africa, right down to the fact that its main supporting characters – outside of the titular robot, of course – are gun-wielding, tattoo-drenched, borderline sadistic thugs, ones that we are supposed to LIKE and ROOT FOR throughout the movie. The main two are named Ninja and Yolandi, and they are played by, erm, Ninja and Yolandi aka South African rap duo Die Antwoord, who we assume must be HUGE in South African pop culture to be given such large roles in a major film like this. By all accounts, these are not good people yet we are expected to become emotionally invested in them when in fact they are simply loathsome and unpleasant; Ninja, in particular, is an abominable human being with brains the size of his bullets and compassion levels even smaller, and you just want to scream with joy when he’s threatened with serious injury or even death because he’s that obnoxious and nasty. He’s like the abusive father in this surrogate family that for some reason gets the redemption arc, which he doesn’t deserve in the slightest. Even Chappie himself, played via motion-capture by Sharlto Copley, is hard to root for when he is so easily persuaded by these criminals to commit acts like steal cars and throw sharp objects at people (all with the pretence that they’re really not harmful to anyone else). We understand that the idea is that the artificial intelligence installed into Chappie, who previously was one of many drones sent in to the streets to replace the Johannesburg military police force, is supposed to give him a child-like mind set, but there’s a huge difference between a child being easily persuaded and a robotic life-force with the intelligence of any computer in the world being persuaded. He’s rather a dumb robot when you really get down to it, and though the visual effects on him are admittedly very well done they don’t distract that this isn’t a great character installed into him. Out of everyone, only Dev Patel gets away with some likability and actual charisma, as the young tech genius responsible for creating the AI that brings Chappie to life. However, he too is saddled with some very questionable logic, such as why he doesn’t simply go straight to the police or even his own company (which we’ll get to) to alert them that the criminals have captured one of their own live drones, instead of just keeping it all a secret for Hugh Jackman’s jealous co-worker – whose hair, by the way, wins Best Mullet in a Supporting Role – to discover. Despite that, Patel plays the only character worth getting invested in, even when the main attraction is a goddamn robot. Blomkamp is a decent director, and certainly gets more life out of performers than, say, M. Night Shyamalan; but as a writer, he increasingly clogs up any sense of logic and plot to give itself a flowing ease. There’s a ton of elements that make no sense in this story; the aforementioned drone company, Tetra Vaal, seems to have some of the worst security as characters seem to access highly important facilities such as a USB that controls each and every drone with incredible ease, and if a character is contacted because he hasn’t returned said USB the worst he gets is a slap on the wrist, and nobody is apprehended if another character threatens someone with a gun in an office-based environment, and there are amazingly no cameras or security guards to see anyone coming in at a moment’s notice. For a company that specialises in high-tech forces in a particularly violent area of the country, MAYBE there should be a tighter eye on proceedings. But that’s not all, some of the acts committed by these criminals are beyond dumb. At one point, Ninja simply abandons Chappie in the middle of a dangerous part of town to apparently teach him a lesson about the harshness of the real world, without thinking twice that this is a highly valuable robot that they have stolen for a reason, that could very easily be permanently damaged, and – surprise, surprise – that’s exactly what happens. In addition, the whole reason they kidnap the robot is to get him to assist with a robbery to help pay back a dangerous crime boss, when they could just easily count their losses and instead hand over a much more profitable piece of technology that can THINK FOR ITSELF. Ill logic like this can truly undermine a film, and though there are some interesting ideas planted into the ground – the final fifteen minutes raises the most interesting questions, and we wish the film were actually about this development more than anything else – it is infuriating that none of them are given the opportunity to grow, leaving Chappie to simply sputter and die as a creative piece that has some good effects, but not enough brain juice.